Medical Guardian is a provider of personal medical alert systems, alert monitoring and dispatch of emergency services. Whether you spend most of your time at home or are fully active, Medical Guardian has a medical alert system to suit your lifestyle. Medical Guardian offers five medical alert system packages, including alert systems for your home and on the go. Prices range, starting around $30 per month. 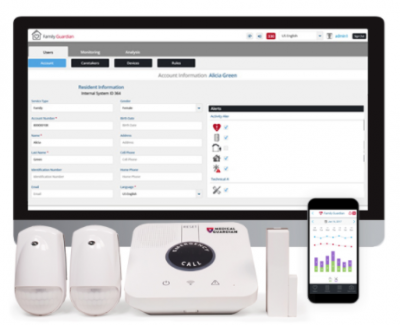 Medical Guardian is a provider of personal medical alert systems, alert monitoring and dispatch of emergency services with alert systems suitable for use both in and outside of the home. Medical Guardian, LLC has been in business for over a decade and is a United States-based company with headquarters in Philadelphia, Pennsylvania. An entirely U.S.-based monitoring facility provides safety with no calls outsourced to other countries. As we age, our needs change. The Institute on Aging reports that as of 2010, the number of people living to 85 and beyond was the fastest growing group of older Americans. In 2050 there are expected to be 19 million people at least 85 years old in the United States, a full five percent of the population. Nearly one-third of older Americans live alone, and some estimates say over 53 percent of these people have physical limitations that lead to a need for a way to call for help quickly in the case of an accident. Bone fractures due to aging alone account for two million incidences a year. Even among those not living alone, the risk of becoming lost or disoriented for those facing dementia, Sundowner’s, and Alzheimer’s is troubling. A personal medical alert system can be a lifeline in these situations. Medical Guardian equipment includes home-based emergency alert units and cellular-based units that are not dependent on a base station for service. Along with providing 24/7 monitoring, operators are trained to help in both emergency and non-emergency situations where a call to another family member or friend is more appropriate than dispatching the fire department or paramedics. For tips on what to look for in a medical alert system check out our medical alert systems buyers guide. Medical Guardian offers three units with a home base and two travel models. All are priced based on their monthly monitoring rather than being a flat fee up front for equipment plus monitoring, and there are discounts for quarterly and annual payments. Each of the home base units works by having a central base station with an emergency button plugged into the home electrical system using a UL certified bracket that prevents the system from being unplugged. Each of these systems comes with at least one wearable emergency button. 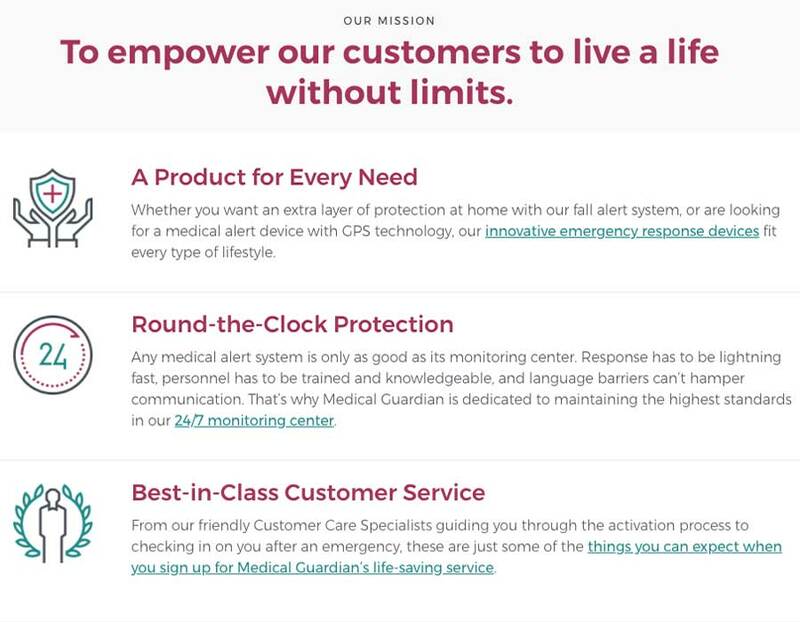 While optional, Medical Guardian will also include a lockbox for the front door at no additional charge with an annual subscription of any Guardian model. The lockbox is useful for storing a house key, so EMTs or police do not have to break down a locked door to get to the person requiring attention. Other paid options are wall-mounted buttons and a pendant with fall detection. The Classic Guardian base unit starts at $29.95 monthly. Fall detection monitoring is available with a specially equipped pendant for an additional $10 a month and is another layer of security, but keep in mind the fall detection service is not yet a perfected feature from any emergency response company. The customer should use the button on the pendant or wristband if they fall. The Home Guardian base unit starts at $34.95 monthly. As with the Classic Guardian, fall detection monitoring is available for an additional $10 monthly and requires a pendant. Customers can choose between a neck pendant or a wristband in white or black. An optional wall-mounted button is available on this model and higher models discussed below. The Family Guardian base unit system starts at $79.95 a month. Three safety sensors installed in the home allow family members to receive notifications via email or mobile app when their loved one presses the emergency button or is not going about their daily routine. A door monitor is used to send notifications when the senior leaves the home. This feature is especially helpful for loved ones with dementia or confusion. The Mobile Guardian is one of the two mobile alert systems offered by Medical Guardian that are not dependent on the base station for service. Plans start at $39.95 a month. The Mobile Guardian is a small emergency device that can be worn in a belt pouch, placed in a purse, or with the customer’s choice of a neck pendant or wristband in black or white. The wearable button has a 350-foot limited range from the primary alert device. Available extras include a wall button and car charger. The Active Guardian is the second mobile alert system by Medical Guardian and comes with the most features. Service plans start at $49.95. Like the Mobile Guardian, this unit is not base-dependent although it does have a charging station. A lanyard worn around the neck provides two-way communication with the Medical Guardian monitoring center with fall detection built in, although fall detection costs an additional $10 per month. Freedom Guardian is well-designed watch to for those who are active and on the go. It has a touch-screen with large icons and features advanced location tracking, reminders and alerts, analog watch face, audible features, color options and more. It pairs with the Freedom Guardian mobile app which is available on Google Play and the Apple Store. Freedom Guardian starts at $44.95 per month with a one-time equipment cost of $99. Medical Guardian has no contract and you can cancel service at any time. If you choose to cancel service, simply return the equipment and you will receive a prorated refund based on the day the device was returned to Medical Guardian. Medical Guardian alert systems come with varying features. Features depend on which package you purchase and whether it’s a home or travel package. This chart compares Mobile Guardian’s different medical alert packages and their features. Customer reviews through the Better Business Bureau (BBB), where Medical Guardian has an A+ rating, highly praise the monitoring service and response to emergencies when the unit is activated. A few negative reviews deal with product malfunctions along with complaints about billing issues. The majority of these seem to be from family members of seniors who were sent units but never used them. In some cases, the family did not notice their loved one was not using the alarm devices until over a year had passed. The company has addressed most complaints. Medical Guardian received mostly five-star reviews from verified customers on ConsumerAffairs and responded to complaints to resolve any issues. What is the point of having a medical alert device that works with WiFi if the device has GPS? 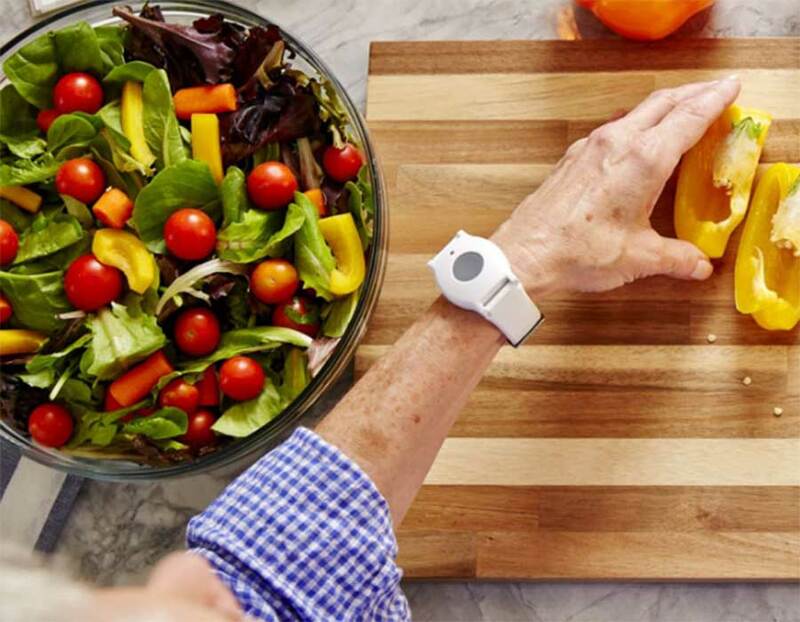 GPS-enabled medical alerts are necessary for active seniors who frequently leave their homes. GPS lets monitoring centers find you no matter where your location is. The Active Guardian model is also WiFi-enabled to make pinpointing someone’s location even more specific by using the nearest WiFi hotspots in your current area. These hotspots are plentiful in most locations around the United States. Highly water-resistant, which is not the case with all cell phones. Will not fall into the water where you may not be able to retrieve the device safely. Will not slip out of your hand if you fall while your cell phone may be irretrievable after a fall. No dialing, just a push of a button. There are several emergency situations where you could be too disabled to make a call. Note that the fall detection does not work 100 percent of the time, which is the case across all manufacturers of this type of device. Press the button if you fall. How do I know when to consider emergency monitoring for myself or a loved one? The most obvious reason to use a monitoring device for safety is if an emergency is likely to be brought on by a seizure, stroke, heart attack, or conditions such as Parkinson’s disease. Other considerations are when the individual is frequently home alone or traveling alone, recovering from surgery or having difficulty communicating due to hearing loss or other medical issues. Medical Guardian devices are also ideal for the senior who enjoys an independent life but would simply feel safer with a way to reach emergency services quickly. What is the benefit of having U.S.-based monitoring? Having monitoring facilities in all fifty states as well as Puerto Rico and Canada reduces the chance of communication failure due to language barriers. Operators speak English, Spanish, or another language using a third-party translation system. Operators are available all day, every day, even on holidays. What emergency training do the operators have? Medical Guardian’s operators are trained to know when to contact emergency services, a relative or other designated safety contact to avoid sending an ambulance when it’s not necessary. Not all monitoring services can make that distinction. Medical Guardian has service awards, memberships, and certifications from The Electronic Security Association, Underwriters Laboratory (UL), The Monitoring Association TMA Five Star Certification and Factory Mutual Approvals. I don’t have a landline. Can I still use Medical Guardian emergency response services? Only one of Medical Guardian’s four models, the Classic Guardian, requires a landline. The Home Guardian, Mobile Guardian, and Active Guardian all use AT&T’s nationwide cellular network at no additional cost to the customer. You do not need to be an AT&T subscriber. Choosing the right medical alert company is a critical decision. Consider what each service package offers, then balance each package’s ease of use with the cost. In this age of outsourcing call center duties, Medical Guardian’s U.S.-based monitoring helps ensure communication between the senior and the operator so that emergencies are addressed with no time wasted. To learn more about Medical Guardian, call 888-362-3950 or check out their online order form.